The former CIA station chief in Colombia is highly regarded, not least by former Obama administration officials. Juan Cruz, a career veteran with the CIA has been named as director for Western Hemisphere affairs at the National Security Council, according to several sources familiar with the appointment. Despite a low public profile due to his long career in intelligence, Cruz is well known to top former U.S. officials who spoke highly of his record, suggesting he was well equipped for job as a president's principle adviser on the Americas. He starts work Monday, sources told Univision. Several former senior officials in the Obama Administration were quick to back his selection. "Strikes me as a good choice, knows the region, has a lot of good contacts, pragmatic," responded Mark Feierstein, who held the post at the end of the Obama administration. Cruz earned high praise for his time as station chief in Colombia a decade ago at a crucial period in the battle against drug trafficking and the left wing guerrilla insurgency. "His stay in Colombia coincided with the years of greatest success against the drug cartels and blows against the guerrillas. He was a great ally of Colombia," Colombia's Vice President Oscar Naranjo, told Univision. "We worked together," added Naranjo, a retired general who was Colombia's chief of police. Naranjo highlighted Cruz's role in several of the "most productive and most efficient intelligence operations," including military strikes against top leaders of the FARC (Revolutionary Armed Forces of Colombia), Raúl Reyes and Jorge Briceño, alias Mono Jojoy, and the dramatic release in 2008 of a group of hostages held by the FARC, including three American government contractors and Ingrid Betancourt, a prominent Colombian politician. Cruz's selection helps solidify the team at the NSC after weeks of uncertainty following the departure of disgraced army general Michael Flynn, President Donald Trump's first choice at National Security Adviser. Flynn was replaced with General H.R. McMaster, a decorated army officer. 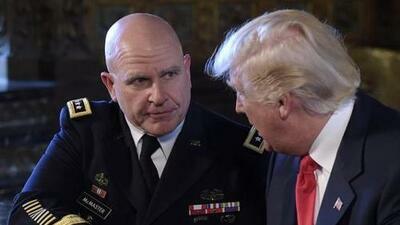 Earlier this week General Ricky Waddell was named as McMaster's deputy national security adviser. The administrations' initial choice as NSC Western Hemisphere director, Craig Deare, was also reassigned after he reportedly criticized Trump's Latin American policies. The White House did not deny Cruz's appointment but would only say "there has been no official announcement of a new Director of Western Hemispheric Affairs." Cruz, who is a fluent Spanish speaker from Puerto Rico, was also stationed in Peru and Brazil before becoming the CIA director for Latin America, according to Univision's sources. "He's an extremely capable and knowledgeable guy who knows the region well," added Dan Restrepo who held the job during the first Obama Administration. "He's a serious guy and very professional," adding that it was the first time in more than 25 years that a former CIA official had been selected for the position, usually reserved for diplomats and academics. Retired army colonel Emilio Gonzalez also held the position during the George W. Bush administration. Part of the White House executive staff, traditionally the job involves advising the president of all matters related to the Western Hemisphere, as well as coordinating inter-agency policy for the region. "It is the person at the White House whose day-in, day-out job is to think about the 34 other countries in the hemisphere," said Restrepo. Normally the NSC director for Western Hemisphere affairs would also be responsible for making sure the president is prepared for any interaction with a foreign head of state, he added, chuckling that every White House is different and that Cruz might have his work cut out with the current president. Cruz did not wear his politics on his sleeve, said Restrepo.